BASK Insulation has assembled a highly skilled and dedicated team to serve you and help complete your project on time. We are committed to helping you reduce energy costs. Our mission is to provide the highest standards in quality and service in our industry. We aim to help protect the environment by helping Canadian homes and communities become more energy efficient. We are committed to helping you reduce your energy costs and increase your home comfort as much as possible and for as little as possible. BASK INSULATION IS YOUR FULL-SERVICE INSULATION CONTRACTOR. We are proud to offer the most advanced commercial-grade equipment and foam products available. Your project will be completed efficiently, cleanly and above all with your safety as our #1 priority. As a family owned business, we are personally involved in every project. You will find us hands-on at your job site, which makes communication efficient and simple. We know that we need our clients more than they need us, and we want only one kind – HAPPY ONES! Every project is unique and the final cost will depend on its size and scope. Before we undertake any job, we provide our client with a written proposal, which clearly states the work to be done, how long it will take and what the price will be. The written proposal is your guarantee that our price will not change for the duration of the project. If you are building a new home, doing home or cottage renovations, finishing a basement or attic, or an energy retrofit project… BASK has you covered! Serving Muskoka, Parry Sound, Georgian Bay, Midland, Penetanguishene, Barrie & Orillia. 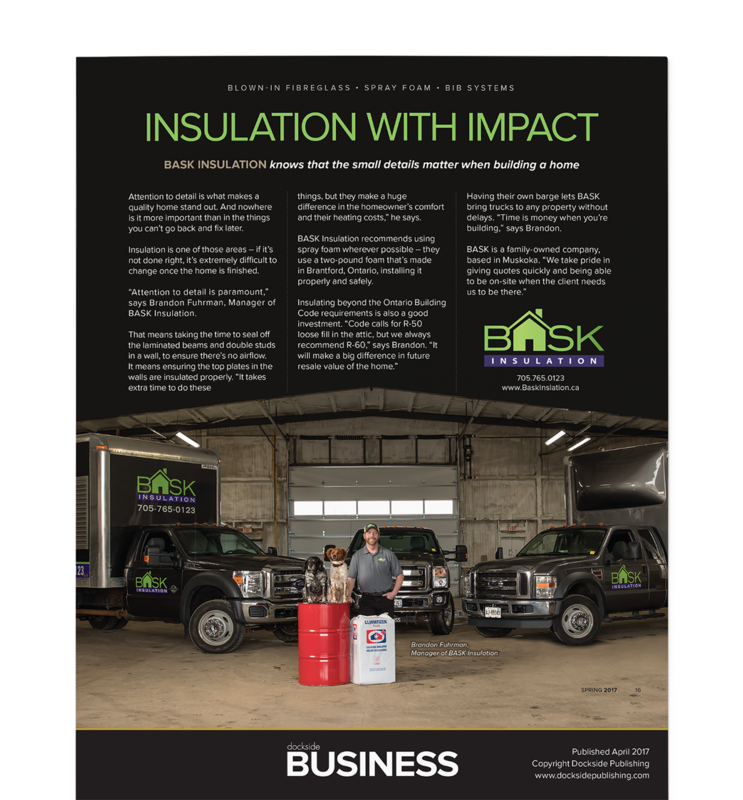 ©2018 BASK INSULATION | BASK PRO INC. | All Rights Reserved.